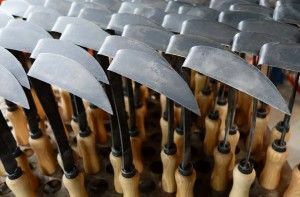 This handhoe is made by our product designers after we started to do business in Japan. Today most used as a handhoe for weeding in Borders and Flowerbeds, it seems to be a good grasscutter too. The hoe is made from Boronsteel, cutted on our lasermachines and build to last forever. This type of hoe is also good for left handed gardeners, we build a left and right handed version of it. The total lenght is 320mm, widt 120mm height 30mm.